Resource – WHAT IS JAMES WEARING? When decorating for my clients or for myself, I always put a great deal of emphasis on bed and table linens – well chosen linens help to create a unified vision of luxury and elegance. 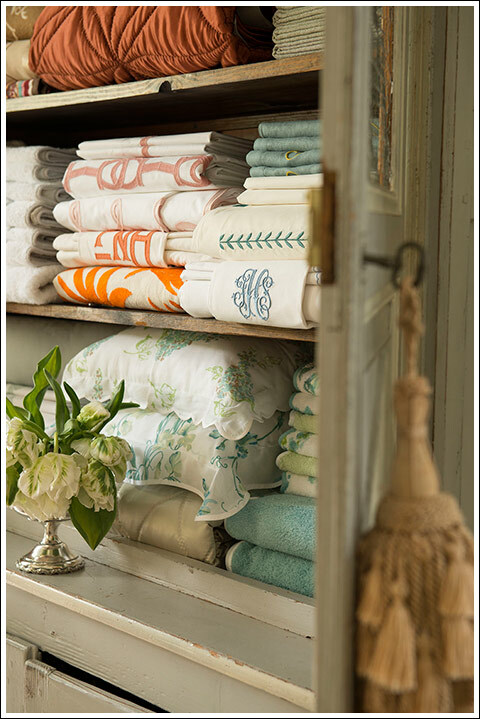 One of my favorite people in the world of couture linens is the impossibly chic Jane Scott Hodges, founder of Leontine Linens. 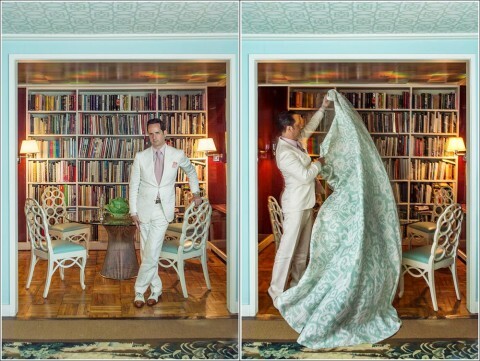 Hodges has been studying and collecting the best of the best in the world of fine linens for the past two decades and has been one of the major forces in reviving the art of couture linens for everyday use. 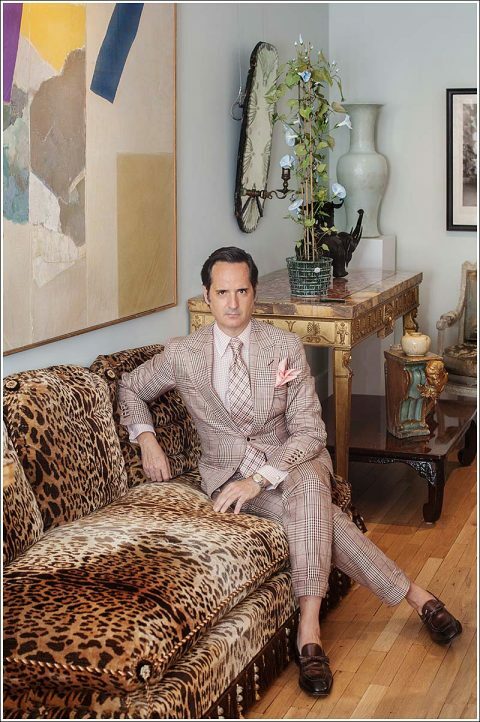 You won’t find ME serving a cocktail without a lovely cloth napkin, and it goes without saying that my own sheets are properly ironed. It’s a touch of luxury that says I care! 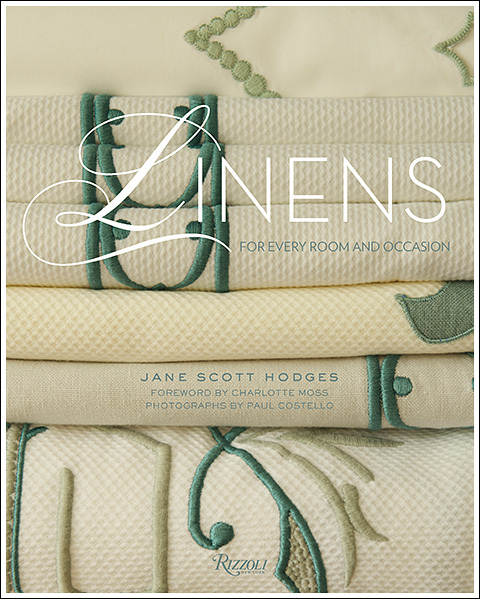 Now, if you are as crazy as I am about linens, bedding, and napkins, you simply must run out and purchase Linens: For Every Room and Occasion by Jane Scott Hodges. It’s a glorious Rizzoli volume filled with endless inspirpiration — it’ll show you how, for instance, to utilize couture lines in new and exciting ways, combining, say, D. Porthault with custom embroidered and appliquéd pieces from Leontine and things from John Robshaw (which incidentally is how I make my own bed!). 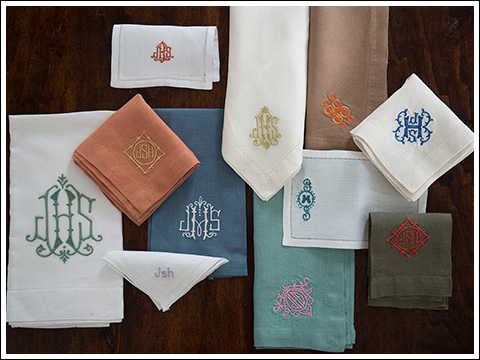 I love vintage appliquéd cocktail napkins and custom designed monograms as well. For my table setting, a hand blocked Indian cotton table cloth mixed with custom embroidered napkins, for instance, creates the most marvelous mix. You get the idea. My point is, it’s important to have a variety of pieces to create different looks and moods – whether mixing the humble with something more formal or having something absolutely elevated to create the most elegant table setting. 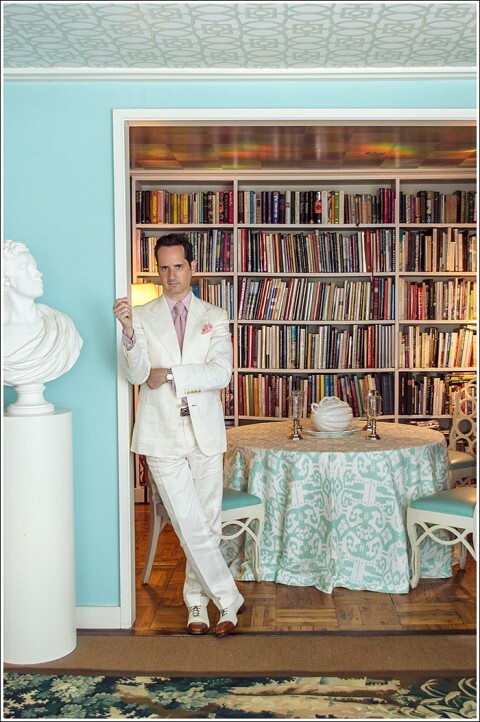 You’ll find all of this in Hodges’ Linens – it’s rich with advice from Hodges as well as decorators and other style gurus, all copiously illustrated with the most gorgeous photos. Do pick your copy of Linens: For Every Room and Occasion on Amazon.